Set up in November 2015 by brothers Alfie and Harry, along with business-partner Charlie, Rag & Bone Coffee’s a welcome addition to the Victoria Station/Westminster area. The patch, home to the venerable Flat Cap Victoria at Strutton Ground Market (where Alfie worked for five years, learning the trade of making coffee outdoors), is now slowly gaining more decent coffee, Rag & Bone joining Iris & June, which opened in 2014. Rag & Bone is a coffee cart which has its home in front of St Matthew’s Church on Great Peter Street, serving single-origin espresso from south London social enterprise, Old Spike Roastery. The coffee changes on a monthly basis, Rag & Bone receiving “whatever’s good” from the Roastery, plus there are retail bags of beans for sale. In the summer months, iced coffee joins the usual espresso-based options on the menu, all served with a friendly smile and warm welcome. Rag & Bone is slightly off the beaten track, tucked away to the east of Victoria Station and west of Millbank and the Thames. It’s also equidistant from the two main east-west thoroughfares, Victoria Street to the north and Horseferry Road to the south. However, it’s definitely worth making a detour for. There’s not a great deal to see at Rag & Bone Coffee, just a straightforward coffee cart under a large umbrella, parked behind the railings in front of the church. It really is what you see is what you get, catering to mostly nearby office workers (hence no weekend opening). 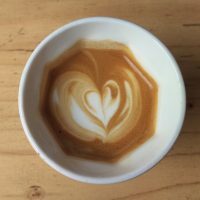 The espresso-based menu is pretty comprehensive, offering espresso and Americano options for those who like their coffee black, while the with-milk choices ranging in size from a macchiato to a latte, with multiple options in between, including piccolos, cortados, flat whites and cappuccinos. Unusually in the speciality coffee world, all of these are available as either single or double shots, with the exception of the piccolo. The single-origin on offer during my visit was a Gisuma from Rwanda, and it was my first taste if coffee from the Old Spike Roastery. This social enterprise was set up at roughly the same time as Rag & Bone, so the two have grown together. Old Spike aims to roast first class coffee while helping homeless people in the community. This includes providing training, housing and jobs to the local homeless. For more on Old Spike, please visit its website. As an introduction to Old Spike, the Gisuma was an excellent advertisement, both for Old Spike’s capabilities as a roaster and Rag & Bone’s ability to pull a good shot. I went for a flat white, which, since Rag & Bone is takeaway only, I had in my Therma Cup. My coffee was smooth and well-balanced, with the fruity notes of the coffee coming clearly through the milk. The milk was also superbly steamed, holding the pattern of the latte art to the bottom of the cup. If you are in the area, particularly if you’re down Westminster way, Rag & Bone is definitely worth seeking out, if only for a cheerful five minutes’ of conversation (or longer, I was there for about half an hour) over your coffee with Alfie or, occasionally, Harry (who can usually be found around the corner working on the Flat Cap Victoria barrow). December 2016: Rag & Bone Coffee was a runner-up for the 2016 Brian’s Coffee Spot Special Award Award. February 2019: Rag & Bone has taken over the coffee operation at Sharps Coffee Bar. This entry was posted in Coffee Carts/Stalls, Saturday Short, South West London, Takeaway and tagged include, Old Spike by Brian Williams. Bookmark the permalink.